The demand by consumers for green building practices continues to rise. Consumers want their new homes or offices to reflect their desired design while respecting the environment now and in the future. 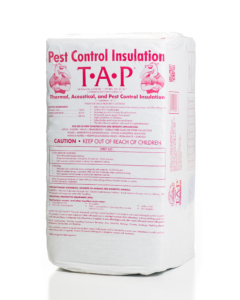 TAP Pest Control Insulation provides professionals such as pest management professionals, installation contractors, and both commercial and residential builders with the flexibility to install a superior thermal insulation product as well as a protective barrier against pests. Thermal, Acoustical, Pest Control (T·A·P®) Insulation is a thermally and acoustically superior insulation product that is environmentally sensitive while permanently controlling pests. It is made principally from recycled paper that is diverted from landfills. The paper is reduced in size and then fed through a disc mill, whose exceedingly fine tolerances explode the fibers into a soft, gray, cotton-boll-like substance. The product is infused with borates through a proprietary process. TAP Pest Control Insulation is a ‘loose-fill’ insulation, so it is installed by blowing the product into attics on top of existing insulation or into attics and wall voids of new construction. It will reduce heating & cooling costs up to 30% annually by keeping structures warmer in the winter and cooler in the summer. Customers may also qualify for tax credits. TAP Pest Control Insulation also controls common household pests that nest in attics and walls like roaches, ants, termites, and silverfish. TAP, therefore, provides a long-term, preventative approach helping protect structures from many common household insects while reducing energy consumption. How Does T·A·P® Pest Control Insulation Work? TAP Pest Control Insulation is not only an innovative approach to pest control, it is one the best performing insulations available to today. Outperforming traditional insulation by 32% and, as a denser, loose-fill insulation, TAP Pest Control Insulation fills in all of the nooks and crannies traditional insulation rolls do not. The science tells the story, but simply put, TAP Pest Control Insulation just works better! Not only does TAP Pest Control Insulation outperform other insulation from a thermal and acoustical standpoint, it takes less energy to manufacture. Only TAP Pest Control Insulation affords your customers a triple benefit of a more energy-efficient thermal envelope, greater acoustical comfort, and the added value of pest control all wrapped up in an innovative pesticide. It is simple…no other pesticide or insulation product comes close! Not all insulation is created equal. In fact, insulation made of cellulose has a greater R-value (resistance to heat transfer) at R-3.6 per inch than traditional insulation. The benefit to your customers is that fewer inches of TAP Pest Control Insulation are needed to protect the home from the winter cold and summer heat. Learn more about R-values. TAP Pest Control Insulation is, first and foremost, an EPA-registered pesticide, NOT a treated insulation. Some insulations add an EPA registered chemical intended solely to protect the insulation itself. These are considered treated insulations which do not help protect the structure of the home and must refrain from making pesticide claims. TAP Pest Control Insulation, however, is a registered pest control product backed by the EPA and a lifetime warranty that offers an additional layer of home protection and the peace of mind your customers seek. TAP Pest Control Insulation is a proactive, preventative approach to pest management which follows current Integrated Pest Management (IPM) techniques. This coupled with the thermal and acoustical benefits of cellulose elevate TAP Pest Control Insulation as THE insulation choice for homeowners and the professionals that serve them. When in doubt, ask to see the EPA-label. Need more information on how cellulose insulation compares to other insulation? View how TAP Pest Control Insulation compares. TAP Pest Control Insulation is the only insulation product registered by the U.S. Environmental Protection Agency to control insects and provide superior insulation qualities. TAP Pest Control Insulation satisfies the demand for ‘green’ sustainable construction practices by the ever-growing, environmentally-conscience government as well as commercial and existing residential home customers. TAP Pest Control Insulation uses proprietary material and is professionally installed by authorized installers. TAP Pest Control Insulation is cost-effective – a one-time investment with no re-treatments required. TAP Pest Control Insulation is an ENERGY STAR® Partner being recognized as a qualified insulation product. TAP Pest Control Insulation routinely undergoes frequent and rigorous testing to maintain its UL Classification. Read our client testimonials, learn how TAP Can Improve Your Bottom Line, or Contact Us and let us introduce you to this innovative and energy-smart insulation product! T·A·P® Pest Control Insulation is a registered trademark of Pest Control Insulation, LLC (US Patent No. 6,578,782). 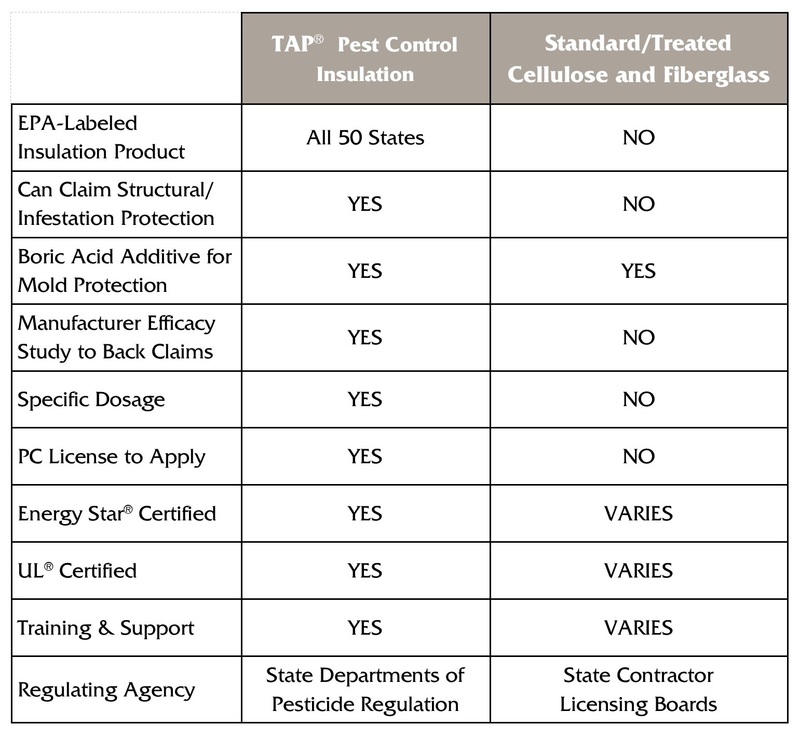 T·A·P® Pest Control Insulation is an EPA registered product (EPA Reg. No. 89140-1) that is acceptable for use around people and pets.